You saw this one coming. 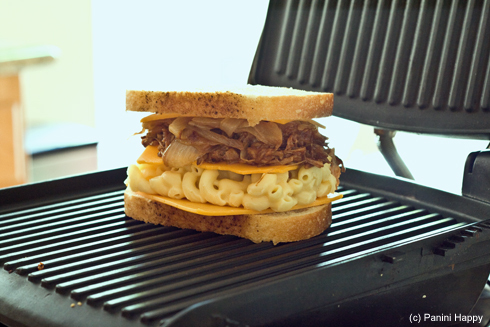 After my visit to the Grilled Cheese Truck I felt compelled to try my hand at recreating that Cheesy Mac & Rib sandwich on the panini grill. The task was made a whole lot easier once I found out the recipe was published in Food Network magazine this month as part of a feature about National Grilled Cheese Month. All I had to do was decide on which macaroni and cheese and pulled pork recipes I would use, the rest was mostly a matter of careful assembly. 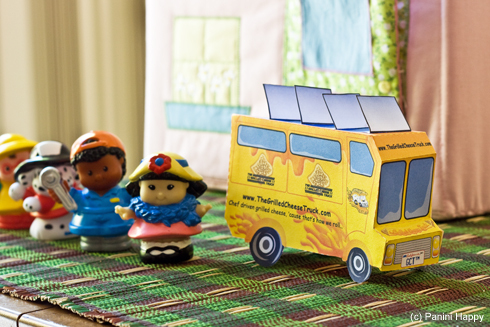 And speaking of careful assembly…how cute is this little make-your-own Grilled Cheese Truck?! Ever since I downloaded and pasted this thing together my three-year old has embraced “grilled cheese truck” as her new favorite pretend game. “Everybody wait in line! 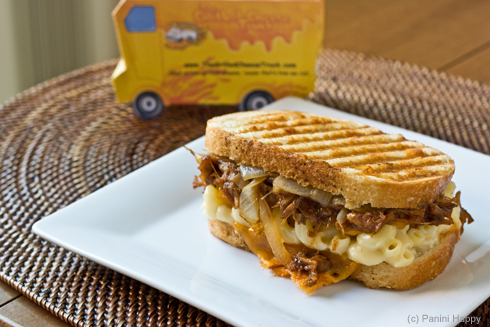 The Grilled Cheese Truck is almost here!” Fisher-Price, are you listening? Little People Food Truck. You’re welcome. After piling on my “slice” of chilled mac and cheese, barbecue pulled pork, caramelized onions and sharp cheddar cheese I was staring at one tall sandwich! I have no idea how the Grilled Cheese Truck folks manage to flip theirs. Maybe they don’t fill it quite as high. I toyed with the idea with just making these in a skillet as directed in the recipe but once I realized how precarious flipping it would be, the panini grill seemed like the easier way to go. As I previously mentioned, this sandwich is a fantastic – albeit extremely caloric – concept. My version tasted remarkably like the original. The bread was a little less crispy, but I just couldn’t bring myself to use the mayonnaise or nearly as much butter as the Truck does (an entire stick for 4 sandwiches?!). I also opted to use sourdough instead of buttermilk bread as I needed something a little sturdier to stand up to the panini grill. Other than that, I kept it pretty much the same. If you can’t make it to LA to track down the Truck, this recipe will get you pretty close. Meanwhile, melt 2 tablespoons butter in a skillet over medium heat. Add the onions and cook, stirring, until caramelized, about 20 minutes. Season with salt and pepper. Melt the remaining 2 tablespoons butter and brush on one side of each bread slice. Flip over half of the bread slices; layer 1 slice of cheddar, 1 macaroni-and-cheese square and another slice of cheddar on each. 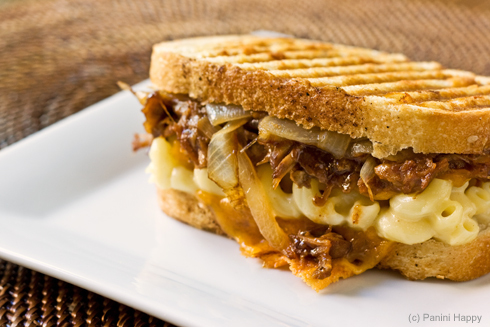 Top each with one-quarter of the pulled pork and caramelized onions and another slice of cheddar. Top with the remaining bread slices, buttered-side up. Working in batches, cook the sandwiches until the cheese melts and the bread is golden, about 5 minutes. 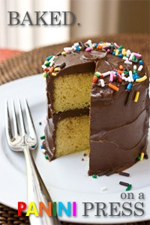 Looks completeley crazy, decadent and delicious! I want to try it. I have never seen mac n’ cheese in a sandwich before. Could this grilled cheese be any more decadent & fabulous!! This sandwich is outrageous – I think my preschooler might like a grilled mac and cheese sandwich. Fisher-Price take note – that is one cute grilled cheese truck! I knew I would see this one on your site:) Love it! It had to be done, lol. So excited to find a blog dedicated to paninis. genius. and this looks incredible, thanks. I just saw this on the cover of Food Network magazine when I was at the grocery store this morning and was going to look up the recipe when I got home. But, this email was waiting for me instead. Perfect timing! To make the bread crispier without using mayo, how about a light dusting of parmesan cheese? What a sandwich! I can’t think of anything more decadent…or more wonderful. Now that is one tasty looking grilled cheese sandwich! So much fun to put mac and cheese on a sandwich. I love the addition of pork here. HOLY MOLY!! Deng that is a serious grilled cheese. I always miss this truck, or see if after I am already stuffed. This sounds like the absolute best thing ever. I’m going to make it soon. What a great combination… and a messy sandwich. yum! This sandwich may be the most beautiful thing I’ve ever seen. I. Want. Oh, wow! Now that’s a decadent grilled cheese! This is AMAZING..and kind of horrifying…but mostly amazing! Mac and cheese doesn’t last very long in our house, but I might hide some from the next batch so that I can make this. Saw that you’re attending BlogHer Food Conference this year…it’s my first time. Have you been before? 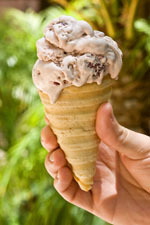 Looking forward to a weekend with fellow foodies! You have no idea how happy I am to see this recipe!! I wanted to try out this truck, but when I found out that it uses Tillamook cheese, my heart dropped. Unfortunately, I’m one of the weird few who doesn’t like Tillamook (I suffered while living in Oregon haha). So, I could totally use a different type of cheese with this recipe. Thank you so much! It looks amazing. is the mac and cheese able to get warm while toasting the grilled cheese?